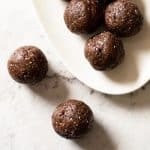 These Thermomix Peppermint Bliss Balls are made with all nourishing ingredients and are great for keeping in the fridge for a standby snack. They are also nut free which makes them ideal to pop in a school lunchbox. 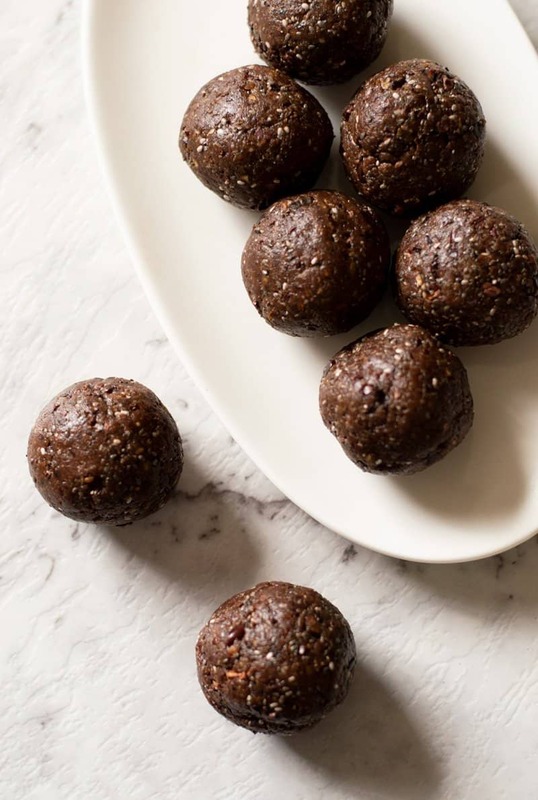 These little balls of goodness take no time to make and are packed full of healthy ingredients. 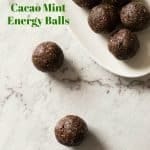 The classic combination of mint and chocolate work really well and the cacao nibs give them a lovely crunch. They’re based on a similar product I always buy at the petrol station every time I fill my car up. It was costing me $3.30 each time so I decided to make my own for a fraction of the cost. An energising nut free snack which is handy to keep in the fridge to keep the hunger pangs at bay. Weigh the sunflower seeds into the TM bowl and grind 10 sec/speed 9. Weigh the dates into the TM bowl making sure there are no stones left in them (see Note 1) and chop 30 sec/speed 7. Add all the other ingredients except for the cacao nibs and mix 10 sec/speed 5. Add cacao nibs and mix 3-5 sec/reverse/speed 4. Shape the mixture into walnut sized balls and refrigerate for half an hour before eating. A lot of these types of raw recipes call for Medjool dates, which are larger and more stickier and triple the price. I find that home brand regular dates work just as well. If you buy pitted dates, there is a small chance a stone or two is left behind so worth double checking. This has happened to me before and I almost broke a tooth! Keep stored in the fridge in an airtight container.